Sometimes, no matter how intense your workout or strict your diet, you can’t seem to ditch stubborn fat. We all have certain trouble areas where flab builds up and doesn’t shed, despite our best efforts. Wouldn’t it be great if you could reduce those problem areas without the traditional methods like diet and exercise? Now you can. Our medical staff at Luminous has mastered the technology to administer a procedure that’s safe and comfortable – and provides you with results that you’ll absolutely love. Within one treatment, you’ll be on your way to achieving the sleek, toned body that you’ve always dreamed about. Cool Sculpting works by utilizing Cryolipolysis technology. Essentially Cryolipolysis freezes fat. Cool Sculpting by Allergan uses a focused cooling process that targets fat cells below the skin’s surface. *¹ Read the science behind Cyrolipolysis here. 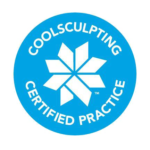 What are typical Coolsculpting reviews? How long does a Coolsculpting treatement take? What are typical Soolsculpting side effects? Cryolipolysis is a focused cooling process that induces lipolysis (the breaking down and necrosis of fat cells) without damaging surrounding tissue. Fat cells that are frozen can then be collected by the body’s lymphatic system for removal. 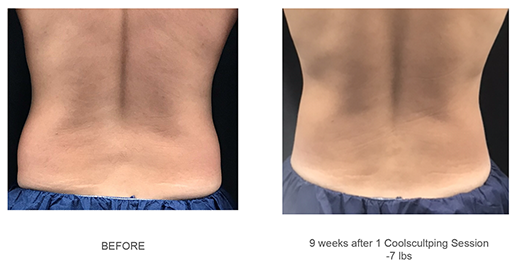 Because the full results of Cyrolipolysis take, on average, 3 months to fully manifest, CoolSculpting results can be more natural looking than surgical alternatives.¹* Learn about the science behind cryolipolysis here. Can Coolsculpting treat my neck area and face? CoolSculpting has been FDA cleared to help healthy men and women lose fat around their midsection, waist, hips, upper arms, and thighs.¹ The CoolMini is FDA approved to reduce fat under the chin and in the neck area. Can Coolsculpting reduce upper arm fat? Allergan, the makers of Cool Sculpting recently released a new Cool Sculpting applicator specifically designed to treat upper arm fat. Many patients want to know is CoolSculpting permanent and how long does CoolSculpting results last. Unlike weight loss products that temporarily shrink fat cells, Cool Sculpting is scientifically proven to destroy a portion of targeted fat cells,¹ that are metabolized and eventually excreted from the body as waste, making Cool Sculpting a non-surgical, non-invasive alternative to liposuction! **Results may vary. Luminous is reputable for complete customer satisfaction for completed treatments. Unless otherwise noted, testimonials provided for Luminous clients of who have Results may vary per client. No treatment is promised to provide permanent results. A guarantee is neither provided nor implied.